The Czech Federation and the Karlovy Vary Worlds Organization rolled out one of the best World Championships ever. The incredible organization of the event, combined with racing in a classic European urban environment made the 2006 World Championships truly a remarkable event. For the USA team, it was a blend of the "old and the new" as our best Masters Racers joined our Senior Team for the World Championships. Three of the Masters pulled double duty (John Pinyerd, David Jones and Mike Beck) by racing in World Championship Classic and Team Events as well as Masters Races. In the Classic race, Andrew McEwan pulled to within 5.7% back of winner Kamil Mruzek of Czech and finished 21st. Master's racer David Jones finished a respectable 61st in the huge Kayak class. But it was Eric Orenstein and Geoff Calhoun who were inspirational that day. Due to logistical problems, the pair had not arrived in Karlovy until the evening before. As a result, they barely had time to get their boats inspected and make it to the put in literally with in minutes of the start. Calhoun ended up finishing 44th. Orenstein, who had never seen the river before, beat racers from a half dozen other countries and finished in 64th place. 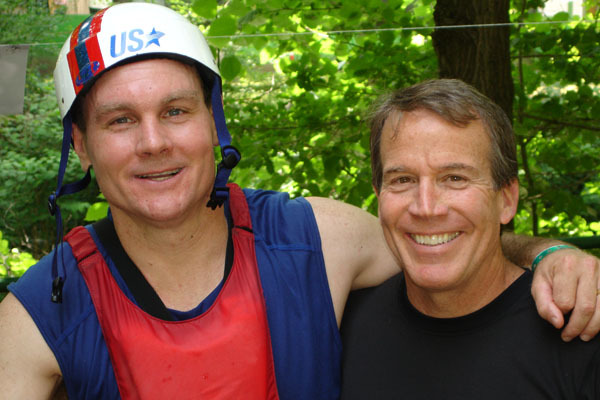 Orenstein was presented the "Brave Heart Award" by Wildwater Chairman John Pinyerd. Team USA will always truly be grateful to Mike Harris who drove all over central Europe to rescue the pair from the Munich airport. Tom Weir led the C-1 team in the classic race with a 19th place finish behind the winner, Emil Milihram of Croatia. John Pinyerd placed 24th followed closely by Mike Beck who finished 26th. Sprint Results were similar. In the K-1 class, Andrew McEwan lead the USA team and finished 24th behind the winner Max Hoff of Germany. With more time to prepare, Geoff Calhoun moved up to 32nd and Eric Orenstein moved up to 52nd place. In the C-1 Sprint, Tom Weir produced yet another top 20 finish for the USA behind the French who took the top two podium spots. With an impressive 7 medals out of 12, it's obvious that the French team really is focusing their training on the Sprint event. Our Sprint specialists would be wise to benchmark off of their training. In the Team Races, the USA really demonstrated teamwork and sportsmanship. David Jones, a veteran of a dozen teams, gave up the team race spot he had earned to first time team member Eric Orenstein (so Eric could gain the experience) and that is what is listed on the "official results". But on race day morning, it was Jones who raced with McEwan and Calhoun as Orenstein was too sick with a stomach ailment to race. The veteran Jones worked flawlessly with his teammates to surf their wakes to a finish time that was 30 seconds faster than his best individual time and a 14th place finish. In the C-1 Team Race, the USA Team of Weir, Pinyerd and Beck cruised to a 6th place finish. For Team USA, the real excitement of the World Championships turned out to be the Master's competition. The USA had sent a formidable team and our Master's racers could not wait to see how they stacked up against the Worlds best. The race organizers were careful to handle the Master's race with the same World-Class precision that they employed in the other World's events. Led by USA Wildwater Team Chairman John Pinyerd, veteran team member David Jones, ICF member David Mason, and USA coach Mauricio Tognacci our Masters earned 4 medals. Dave Mason won an uncontested Gold in the 55+ C-1 category. Dave's quote of the day was "80% of life is just showing up". In the 35+ C-1 category, veteran USA Team members Mike Beck and Mike Harris finished 6th and 7th respectively. In the 45+ K-1 category, Italian American Mauricio Tognacci finished third. It's fair that Mauricio is claimed as an American in our results since he serves as our Jr. Team Coach and the Italian Federation had left him off the start list (a mistake that was fortunately caught by the American Team Leaders and corrected). In the 55+ K-1 Class, David Jones finished 3rd against extremely tough competition from France, Germany, Czech, and South Africa. Our friend, Ed Winnacott of Canada was 6th. Bern Collins, age 67, finished 9th. Bern would have finished 2nd in the 65+ age category, if the organizers would have recognized it as a class. 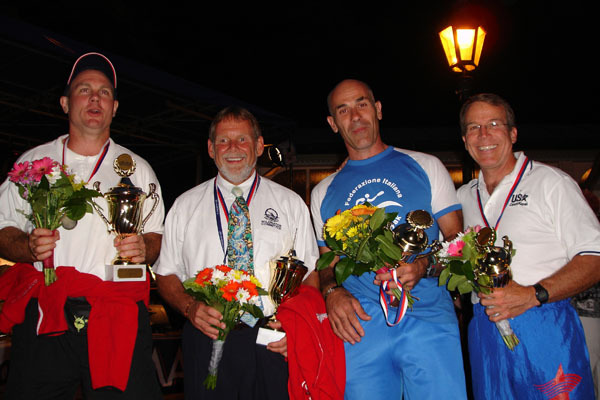 Perhaps the icing on the cake for the 2006 Worlds was the Gold medal finish by John Pinyerd in the 45+ C-1 category against intense competition from racers from Croatia, France, Czech and Slovakia. A priceless moment at the 2006 Worlds was to see the complete shock on the face of the French competitors when they realized an American had won Gold! It is no coincidence that Pinyerd, Jones, Tognacci, Mason medaled in Master's competition. They, along with Bern Collins, truly focused on this event for the past 6+ months and they train together whenever they get the chance. In addition to being training partners, Pinyerd, Jones and Tognacci also serve as coaches for each other. The 2006 Worlds in Karlovy Vary were perhaps the best ever. 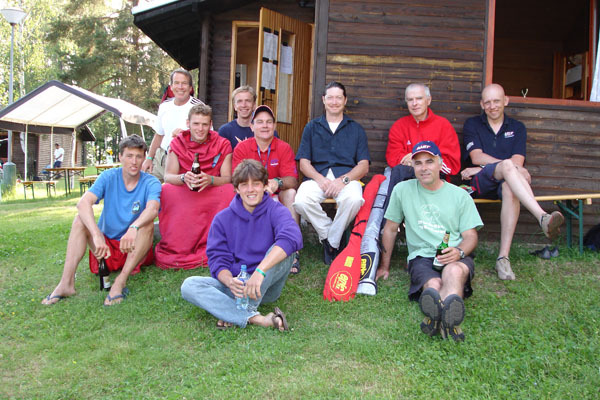 And any time the USA can bring home 4 medals in Wildwater, we have to all be thrilled!